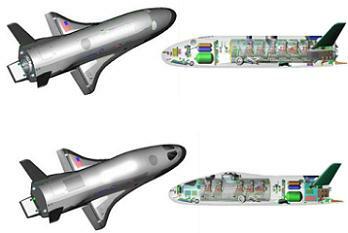 As NASA and its new commercial partners continue to push toward the era of realized commercial crew transportation to Low Earth Orbit (LEO), Boeing has released a paper detailing the potentiality of expanding the capabilities of the U.S. Air Force’s X-37B reusable space plane for cargo and crewed missions to LEO – a proposal, which for unknown reasons, appears to have been pushed aside by NASA’s commercial space division. As stated a Boeing presentation (acquired by L2), the concept of utilizing the X-37B as part of NASA’s COTS and CCDev programs stemmed from the idea that the program would be able to “realize cost savings and acceleration of technology developmental timelines by focusing on the payload. Birthed from the NASA Future-X (1998-2001) and Space Launch Initiatives (2001-2006) campaigns, the X-37B was developed to help lower the cost of LEO transport for post-Shuttle and replacement EELV (Evolved Expendable Launch Vehicle) eras. 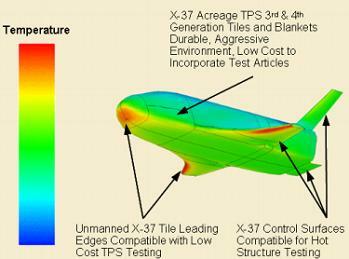 In addition to testing next generation TPS system materials, the X-37B was envisioned as a platform capable of testing autonomous deorbit, entry, and landing GNC; fault tolerant architecture for autonomous on-orbit and entry flight; GPS and dGPS for landing with minimal airfield infrastructure; electro-mechanical flight actuation and brakes; and Li-Ion (Lithium-Ion) batteries for high cycle life and high current capabilities. Moreover, the X-37B would be able to test reusable, deployable and stowable solar arrays; advanced Gr/BMI composite airframes; complex Carbon-Carbon control surfaces; advanced high temperature wing leading edge tiles; hypersonic aeroheating prediction methods; and integrated systems designed for aircraft-like turnaround operations for post-mission processing. Launched on its first test flight on 22 April 2010 by an Atlas V 501-configured rocket from the Cape Canaveral Air Force Station, the first mission of the X-37B spent 224 days in orbit before returning to Earth on 3 December of that year. During entry on 3 December, the X-37B successfully managed its energy, position, altitude, and descent profile using bank angle, pitch angle, and S-turns across a 5,500 nm reentry flight path. Noting the reluctance of the American space industry to fly anything in space that isn’t in some way connected to the heritage of Shuttle, Atlas, Delta, Ariane, any number of Russian engine technologies, or even the Saturn V, Boeing makes the case that the X-37B is an excellent example of space heritage – while providing the added benefit of incorporating new and evolving space technologies (like solar cell technology for reusable solar arrays) into its design. 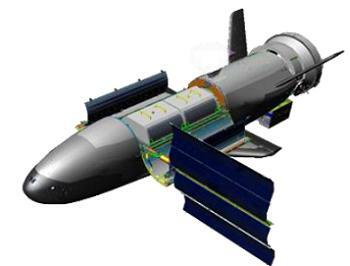 The presentation notes that the X-37B has the capability to perform attitude control maneuvers that are well in-line with NASA baseline standards for ISS and satellite rendezvous operations, and the vehicle’s subsystem fault tolerance for automated aborts from Station and satellites is also well within NASA standards. The X-37B vehicle would then be able to independently test these “multiple competing technologies” during a single demonstration flight to the ISS or orbiting satellite, thus eliminating the need to conduct separate flights for each independent technology. With the retirement of the Space Shuttle orbiter fleet in 2011 came the elimination of the capability to return sensitive cargo, requiring a soft landing, from the ISS. Enter the X-37, the only vehicle currently in operation that is capable of providing a soft, 1.5g class return landing. Making use of the X-37 design would allow sensitive cargo of the biological and material science variety (the science that forms the core of microgravity research aboard the ISS) to be safely and softly returned to Earth inside the X-37B’s payload bay. Following a runway landing, any time sensitive cargo could be safely and quickly removed from the vehicle. Additionally, Boeing states that “At the X-37B’s current size, upmass cargo would be carried internally and externally while downmass cargo would be entirely within the payload bay. 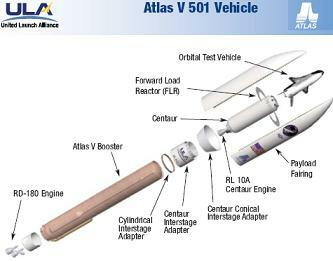 “The considerable excess launch capability of the EELV class launch vehicles and unused volume within the 5m fairing [would] enable the X-37 to carry several large ISS LRUs (Line Replaceable Units) or other items externally on the service module,” notes the Boeing AIAA presentation. Under this proposal, using the X-37B itself with an attached service module, the craft would be launched into a 51.6 degree inclination orbit for rendezvous with the ISS. After arriving at ISS, the X-37B would maneuver itself within the berthing box of the ISS’s Remote Manipulator System (SSRMS) arm. The ISS crew would then use the SSRMS to reach out and grapple the X-37B and then attach it (dock it) to one of the Common Berthing Mechanisms (CBMs) on one of the nodes of the Station. During the course of docked operations, the X-37B would require no support from the ISS, less the physical CBM attachment, as all power and electricity would come from the deployed solar array and onboard batteries. The crew of the ISS would then be able to use the SSRMS to remove all external cargo from the outside attachment points on the X-37B itself. Internal cargo for ISS would be stowed within containers in the X-37B’s payload bay to make transfer of materials to and from ISS easier for the Station’s crew or any robot that might be tasked with moving the internal cargo. All downmass cargo would then be loaded into these containers before the containers would be returned to the X-37B’s payload bay. 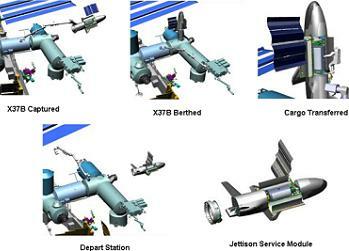 After completion of docked operations, the SSRMS would unberth the X-37B, and the spacecraft would then maneuver itself away from the Station. The service module would be jettisoned prior to the initiation of deorbit, entry, descent, and landing operations. 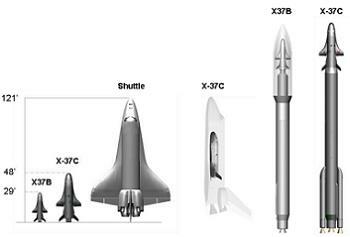 For the consideration of expanding the X-37B baseline design for the inclusion of crew launch and return capability, the Boeing presentation notes that an increase in size of approximately 160-180 percent would be needed to meet a 5-7 crew-size capability. Under this design, the X-37 would nominally be able to accommodate 5-6 astronauts with enough provisions and space for one injured astronaut requiring a stretcher-like return configuration for reentry and landing. 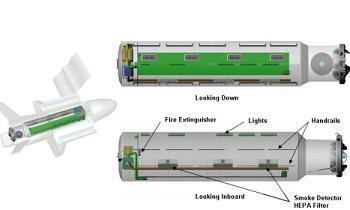 The launch and entry seats for the crew would be aligned along one side of the pressurized volume within the X-37, leaving a clear access path for launch pad climbing and zero-G operations. 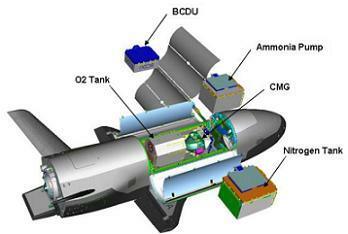 The crew would enter the spacecraft via a hatch on the top of the X-37. The same hatch would provide emergency launch pad egress capability. Completely autonomous, the crewed X-37 would be capable of launching, aborting, rendezvousing, docking, undocking, deorbiting, and landing itself without any input from the crew. Cross-range capabilities of the X-37 design would allow for multiple deorbit opportunities per day to the Kennedy Space Center, FL, White Sands Space Harbor, NM, and Vandenberg Air Force Base, CA. While the Boeing presentation – created in 2011 for the AIAA – makes a fairly convincing case for the evolving capabilities of the X-37B, there is no indication at this time that pursuit of this option is ongoing or even under the slightest consideration from NASA. (Images: Via Boeing and ULA).